How Do I Know if I Have Loose Bodies? When loose bone are cartilage within the hip is discovered it is because the patient has developed pain, loss of motion, and/or hears a clicking sound when the hip is in motion. These loose bodies are like getting sand in your sunscreen. An area that is supposed to be smooth is now rough and causing discomfort. 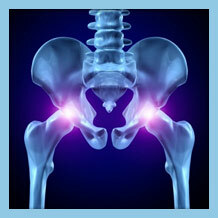 Radiological exams will show a loose object in the affected hip. It is possible to find more than one loose body on an x-ray. When they are removed they will look like tiny irregularly or oval shaped white stones that vary in size but are generally 5 – 20 mm long. Do you have any of these symptoms and think you may be suffering from loose bodies? We have a quick and easy tool to help gather some information from you to help us determine what your problem is and get you on the road to recovery. Loose bodies can cause catching, popping, and pain within the joint. They can also cause damage to the other areas of normal cartilage thus accelerating the arthritic process. Most surgeons advocate removing these loose bodies as soon as possible. Prior to hip arthroscopy, this was rarely done due to the magnitude and dangers associated with the procedure. Now, with these newer techniques, it is done easily and quickly with minimal recovery time. If a loose body is causing significant symptoms, it can be removed through small incisions during hip arthroscopy. Early, middle, late Then; OLSS provides a wide range of treatment options and, because our doctors are the most experienced and best trained in treating loose bodies, we are able to perform many advanced treatments other practices may not be able to offer. The real question is: What treatment is best if you think you suffer from loose bodies in the hip joint? Use our Treatment Check tool to quickly get started in finding the right treatment for you.